Dr Jasneet Singh MBBS, MD (Medicine), FRCI(Rheumatology & Clinical Immunology) has achieved a vast experience. Since past 4 years, he has been practicing in various adult and paediatric rheumatic & immunological ailments as well as Arthritis, Connective Tissue Diseases, and Joint Pain treatments in Ludhiana. And presently, Dr Jasneet Singh has been successfully and expeditiously running his own practice with “The Mediclinic Center” (Arthritis and Rheumatology Center) in Ludhiana, offering world-class facilities for the diagnosis and treatment of all Rheumatic and Autoimmune disorders. It is multi-speciality hospital offers best joint pain treatment in Ludhiana, Punjab. Dr Jasneet Singh MBBS, MD (Medicine), FRCI(Rheumatology & Clinical Immunology) has achieved a vast experience. Since past 4 years, he has been practicing in various adult and paediatric rheumatic & immunological ailments as well as Arthritis, Connective Tissue Diseases, and Joint Pain treatments in Ludhiana. 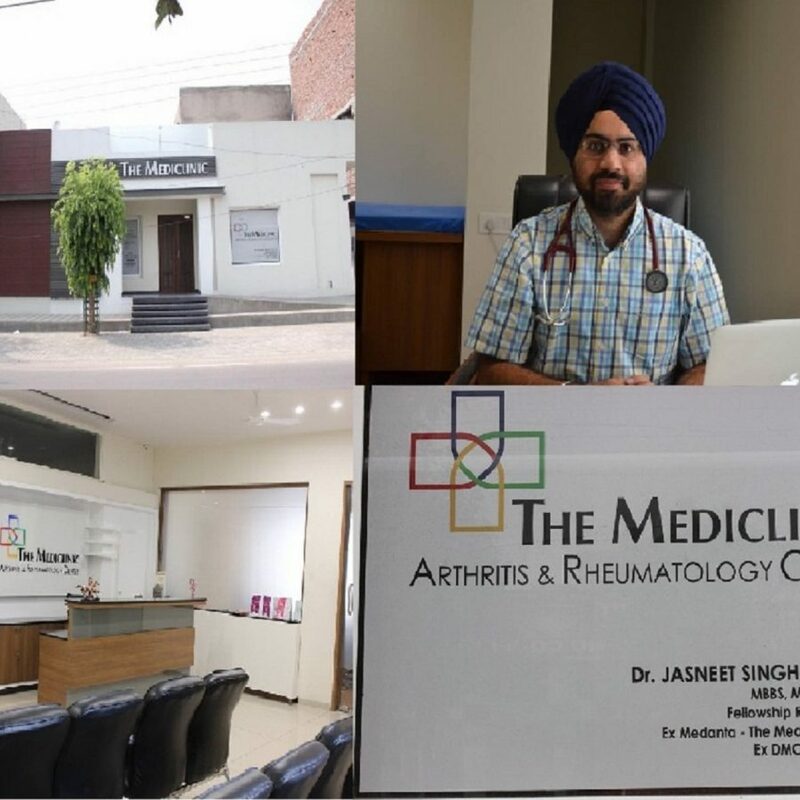 And presently, Dr Jasneet Singh has been successfully and expeditiously running his own practice with “The Mediclinic Center” (Arthritis and Rheumatology Center) in Ludhiana, offering world-class facilities for the diagnosis and treatment of all Rheumatic and Autoimmune disorders. It is multi-speciality hospital offers best body pain treatment in Ludhiana, Punjab.